The last few decades have seen a proliferation of research in the domain of health policy and systems research (HPSR). Major technological advances in medicine and various healthcare innovations have little chances of succeeding if robust country, provincial and local health systems are lacking. HPSR brings together various disciplines to push for a more granular and locally relevant knowledge on how to strengthen and improve health systems. It counters the reductionist worldview of health systems and tries to understand the complexity that emerges from economic, social, political and environmental factors. Public health researchers are embracing HPSR approaches drawing inspiration from multiple disciplines. See for example the three global symposia on health systems research especially the last one on building people-centred health systems in Cape Town, South Africa, several recent articles on building HPSR in journals perceived commonly as rather biomedical in orientation (with the HPSR series in Plos Medicine as a case in point) and the various methodological readers on doing HPSR – including the most recent reader on participatory action research and of course the earlier blue book of HPSR by Gilson et al. In India these are opportune times for HPSR. A large nation-wide programme for strengthening health systems, the National Rural Health Mission has completed its first phase and is in transition to a second phase of engaging with the neglected problem of urban health. The new government is keen to launch a programme for Health Assurance, hoping that this will be India’s answer to universal health coverage (UHC). Also encouragingly for HPSR advocates, a recent review of HPSR outputs from India by Rao and colleages reveals a healthy upward trend of HPSR studies with first authors from India increasing from a mere 92 in 2006 to over 300 in 2013. However, publications in international journals are not the best indicator for integration of HPSR knowledge into practice. At district and sub-district levels, there is a huge need to improve the demand for and application of locally generated HPSR knowledge into practice. And building the capacity of decision-makers and practitioners at these levels is crucial in generating knowledge and its subsequent use. In many low- and middle-income countries including India, research allocations for understanding public health programmes and systematic evaluation of such programmes are lacking. Rao’s review especially highlights gaps in research on governance of health systems in India and a comparative neglect of research on human resources for health and health financing. They also find that the current output of HPSR is limited to some states (provinces), few institutes and researchers. The Keystone initiative is a response to these gaps in India’s HPSR capacity. It is one of the main national level HPSR capacity building initiatives in HPSR and conceived as a specialised programme for early and mid-career health professionals as well as health policy and systems researchers. 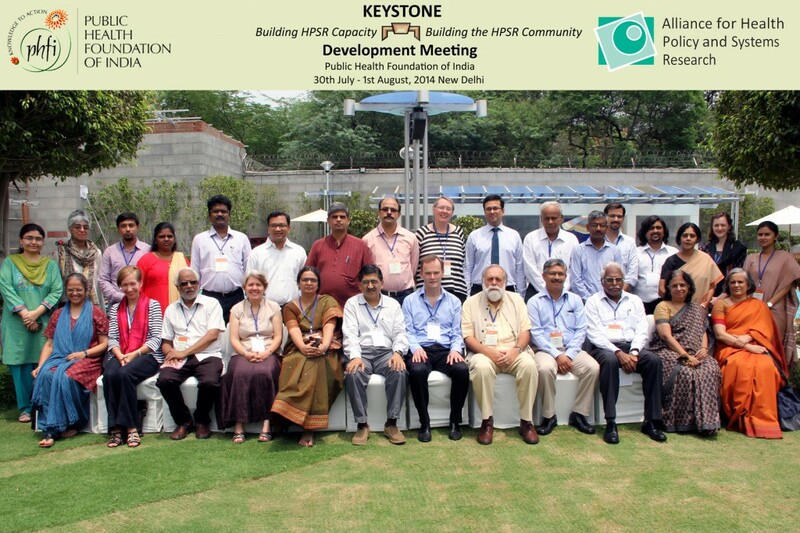 The ultimate goal of KEYSTONE is to activate a nationwide community of HPSR researchers towards addressing critical needs of health systems and policy development in various parts of the country. The kick-off of the initiative entails a short course on HPSR which will draw from dialogues with researchers and HPSR practitioners from various institutions in India, South Africa, UK, Australia and USA. One of the key challenges that the course seeks to address involves the need to ask and answer how and why questions and to understand and address the role of particular contexts in shaping health system performance. The course seeks to tap into latent capacities in social sciences that have not effectively been used to understand health policies and systems. The course also aspires to nurture a community of HPSR practitioners – between institutions and researchers – across the country, while at the same time making linkages to global experience in organising HPSR courses and capacity building of young researchers. The experiences of CHEPSAA and emerging voices for global health have both been influential in the shaping of the KEYSTONE initiative. The initiative has also benefited from the multiple linkages facilitated through Health Systems Global, the fast expanding global community of health system researchers. The inaugural edition of the KEYSTONE course starts in the last week of February in New Delhi. Under the leadership of the Public Health Foundation of India in its role as Nodal Institute of the Alliance for Health Policy and System Research, a group of senior researchers from leading public health institutions from across the country are coming together for designing the curriculum and delivering the course (See Kabir Sheikh welcoming the participants of the conference at the nodal institute). Hopefully, the KEYSTONE initiative will be able to trigger nation-wide interest and pursue locally relevant and methodologically sound knowledge to shape the design and implementation of health systems strengthening and policies in the country. This entry was posted in Public Health and tagged emerging voices, health policy and systems research, health systems research, HPSR in India, KEYSTONE, PHFI, Public Health, Public policy, WHO Alliance. Bookmark the permalink.